The French are coming! That was our slogan as our friends Brice and Aline arrived from Paris for a three-week visit at our home in Mukilteo north of Seattle. As soon as they arrived we unpacked the French goodies they brought us (olive tapenade, French cookies, a bottle of champagne) and prepared for the first event on our list; a road trip through the northern Olympic Peninsula and San Juan Islands. We drove to the Edmonds ferry above Seattle enjoying a sunny passage across Puget Sound with Mt Rainier glowing on the horizon. Arriving at the opposite landing at Kingston we drove on to Port Angeles, a pleasant small city on the Straits of Juan de Fuca across from Vancouver Island in British Columbia, Canada. We drove up to Hurricane Ridge for magnificent views across the Olympic Mountains and had views of Vancouver Island Canada rising above the sea fog across the Straits of Juan de Fuca. Back in Port Angeles we dined on some great fish n’ chips and checked into the room we had reserved at the Downtown Hotel, an old but clean place just a block from the waterfront and ferry landing. The next morning we left the car at the hotel parking lot and walked onto the ferry, the Coho, for the 1 ½ hour passage to Vancouver Island and the city of Victoria. We arrived at Victoria’s tidy waterfront dominated by the venerable Empress Hotel and arranged for bus transport to sprawling Butchart Gardens, about 40-minutes away. The gardens were pleasantly uncrowded since it was September yet many flowers were still blooming and while not a big garden fan myself, this place was impressive with the Japanese Garden area my favorite. After exploring the gardens for a few hours we returned on the bus to Victoria, strolled around the waterfront for a couple hours enjoying the street performers there, and returned to Port Angeles on the trusty Coho and another night in the Downtown Hotel. Next morning, we recovered the car and made the hour and a half drive to trendy Port Townsend at the northeastern tip of the Olympic Peninsula. This is a nicely restored colonial small city with its brick buildings, chic eateries and waterfront with vintage wooden sailing boats. After a beer and burger in a seaside tavern we boarded the ferry to Coupeville on neighboring Whidbey Island where we explored the colonial town of Langley and dramatic Deception Pass at the northern end of Whidbey Island where the turbulent waters of Puget Sound rush through a narrow gorge. A half-hour drive from Deception Pass got us to Anacortes and the ferry to the San Juan Islands. But, before we boarded the ferry to the San Juans, it’s time to go sea kayaking. 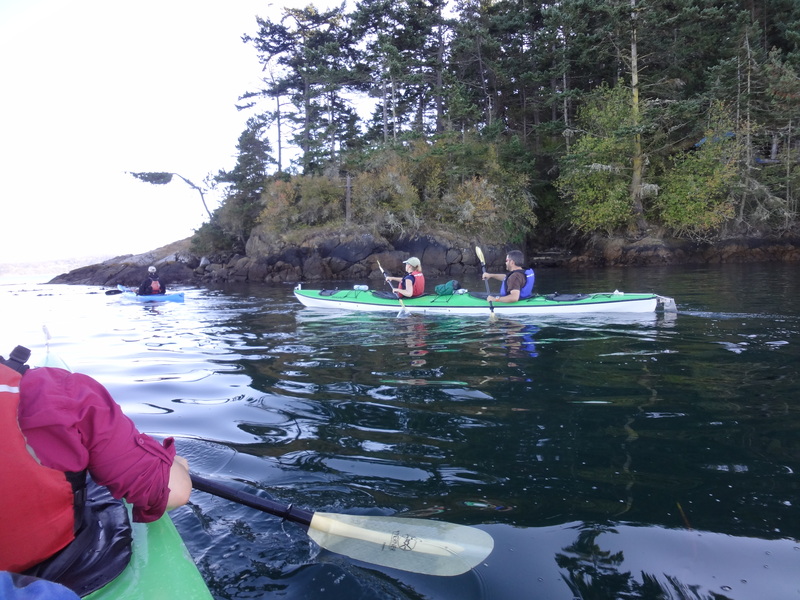 We arranged for a beginners’ lesson and a two hour tour at Sea Quest Expeditions in Anacortes. We met our guide at the marina near the ferry landing where he showed us the basics of entering and exiting the kayak and paddling. Then we paddled around an island near the marina where we watched sea birds and bald eagles fly about and enjoyed out tour immensely. Leaving the kayaks with the guide, we drove to the ferry landing and boarded for the passage to San Juan Island. On San Juan we explored American Camp, the National Park Service Historical Site documenting the “Pig War” where America and England nearly went to war (again) over the killing of a pig in 1859 (of course the real reason was control of the San Juan Islands). We drove to Lime Kiln State Park, one of the best places in Washington State to see whales near shore, but none came by while we were there. We returned to Friday Harbor and boarded the ferry to Orcas Island where some friends operate an organic blueberry farm. We met our friends’ at their cabin and drove up to Mount Constitution, the highest point in the San Juan Islands. The views across the Canadian and American islands from Mt Constitution were great with the white, volcanic cone of Mt. Baker standing above it all. Then we stopped at the island’s main village, Eastsound, for dinner and back to the farm where we baked a fresh blueberry pie and laughed the evening away. Time to go home, so we boarded the morning ferry back to Anacortes and made the 1 ½ hour drive back home stopping at the Tulalip Casino at Aline’s request. At first we complained about the casino stop, but she returned in 45 minutes with $300 in winnings, so we said dinner was on her. After resting up for a day we prepared for the next excursion; volcanic Mt. Baker. We drove to Bellingham near the Canadian border and took highway 542 towards Mt. Baker. This has to be one of the most scenic drives in the United States. We rented a cabin at the tiny town of Glacier and hiked up to Skyline Divide, a 2-mile hike ending in huge alpine meadow surrounded by glacier covered peaks. Returning to the cabin we went into “town” for dinner at Graham’s Restaurant & Tavern in Glacier where we sipped micro-brews in the beer garden while listening to live counter-culture folk music with the tattooed crowd assembled there. Next day we drove to Artist’s Point at the end of highway 542 and walked on short nature trails across a high rock saddle between the massive glaciated peaks of Mt Baker and Mt Shuksan. This is one of the most magnificent mountain viewpoints that you can drive to in the United States, but it can get crowded. On the way back, and acting on a tip from the owners of the cabin we had rented, we stopped at a non-descript pullout along the highway where we found a trail through a grove of massive, old-growth Douglas Fir trees, some of them well over eight feet in diameter. After a quick stop at dramatic Nooksack Falls we drove back to Bellingham and then home going to bed early, all of us exhausted. A day of rest and, . . . it’s time to go backpacking! For this visit, I selected two of Washington’s iconic wilderness treks; Tuck & Robin Lakes and Cascade Pass/Sahale Glacier (reported in separate Trip Reports). Even though Brice and Aline are in good shape and used to hiking, we were all tired after two consecutive backpacking trips, so we relaxed at home for a day, doing laundry and eating. Brice and Aline needed to stock up on supplies to take back to France, so it’s off to Seattle and Pike Place Market where they loaded up on their Northwest favorites; smoked salmon and chocolate-covered cherries. While at the market we had margaritas in the Can-Can, an underground bar with an acrobatic dinner show. Then we went to Seattle Center and toured the Chihully House of Glass (displaying the massive glass works of famed Seattle artist, Dale Chihully). We finished up the day with live fiddle music at Paddy Coyne’s Irish bar where we had an excellent shepherd’s pie and drove home, thoroughly tired by now. As we drove our friends to the airport, we were already planning their next trip to the Pacific Northwest; climbing Mt Rainier, sea kayaking at Whidbey Island, salmon feasts on the beach. But before then it’s our turn to visit them, this time in Paris. That shouldn’t be too hard to take. Ferry, Port Townsend to Whidbey Island (Coupeville): $8 car & driver + $3 per passenger one way. Ferry, Anacortes to San Juan Island: $49 car & driver + $13 per passenger (round trip tickets only). Ferry, Port Angeles to Victoria British Columbia: $34 each, walk-on passengers, round trip. Chihully House of Glass, Seattle Center: $20 each to enter. Butchart Gardens: $31 each to enter. Backpacking trips: Free except Recreation Pass required to park at trailheads ($30 multiday or $80 annual). Cabin at Mt Baker B&B: $110 for group of four. Downtown Hotel, Port Angeles: Apartment suite, 2 beds with private bath & bedroom, sleeps four, $120.